Former VP, Atiku Abubakar, formally declares his intention to run for President in 2019 – Royal Times of Nigeria. Former Vice President Atiku ABubakar, has officially declared his intention to run for president of Nigeria in the 2019 general elections. Atiku had contested against President Buhari for the APC presidential ticket for the 2015 general elections, resigned from the party in November 2017 and announced his return to PDP on December 3rd 2017. 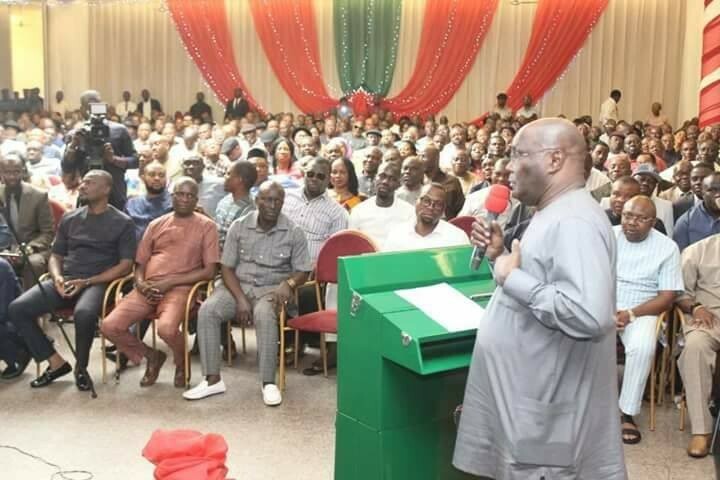 Atiku declared his intentions when he paid a visit to the PDP in Rivers state on Tuesday. During the visit, Atiku said his decision to make the announcement in Rivers State is because he believes Rivers State Governor Nyesom Wike represents what he represented in 1998/99 as the live wire of the PDP. The former Vice President said that he is offering himself to set the country on the path of growth after the serial failure of the APC. According to Atiku, since assuming office in 2015, the APC Federal Government has destroyed the education, health and infrastructural sectors through poor budgetary allocations and releases. He added that he has never witnessed a more divided country like what it is right now under the APC government. He said, “Since 2015, we have not seen a 100kilometres constructed by the APC Federal Government anywhere in the country. I have never seen Nigeria so divided along religious, ethnic and regional lines. This division is as a result of the mismanagement of the APC”.